Contains 48 cards to enhance your force, field iconic warriors and cutomise your units. 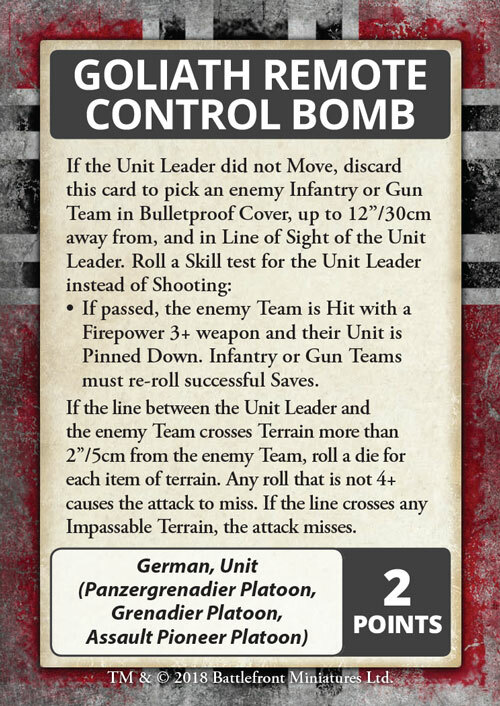 One of the first cards that caught my eye form the Iron Cross Command cards was the Fast Company card, mainly because this was one of the first Flames of War armies I built when I started playing. I bought a bunch of random bits and pieces that I started top paint up, but it wasn’t until the old Stalingrad book came out that I bought my first full army. It was a cheap force with two Tigers and some blisters of infantry but that grew into a fully fledged army. 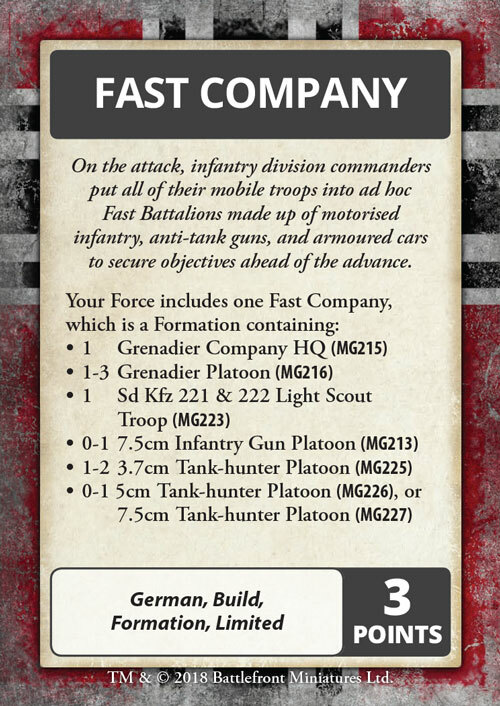 Looking at the Fast Company Command Card I find myself wanting to build it, not just out of nostalgia but because the Formation is crazy good. The Fast Company Formation gives you access to loads of good anti-tank guns with a cheap buy in, making the Formation very flexible and easy to add to other Formations. 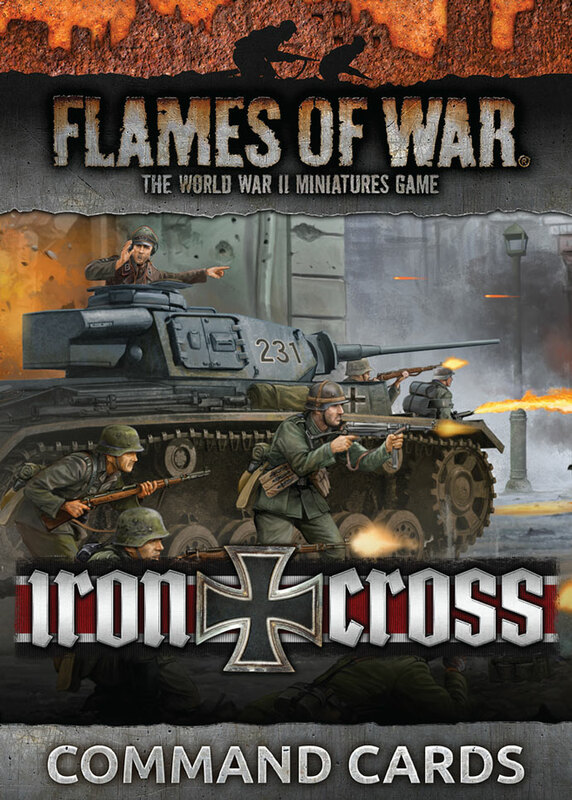 I can’t wait to start collecting this army again after I finish my Panzer III Formation. I love captured tanks, in every form they take. Not only do they give you cool painting challenges, they give you something that you normally don’t have access to. 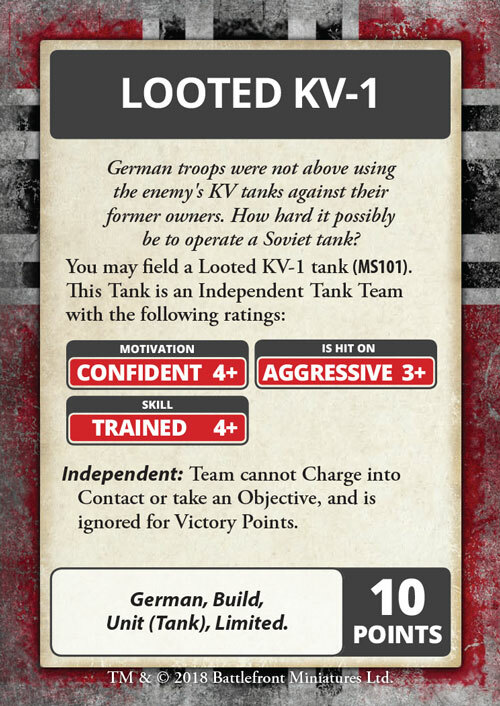 The Looted KV-1 is just great value; you get a heavy tank for just 10 points, while the T-34 will only cost you seven points each. 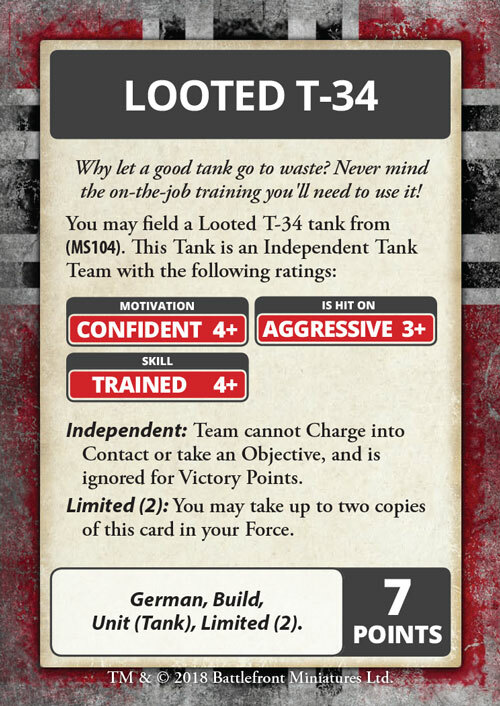 Though these are only single tank platoons they do have the Independent rule making okay if you end up losing them, because you won’t end up losing any Victory Points for the loss. I like the idea of grabbing a couple of these tanks and just throwing them at your opponents army just to wreak havoc with their plains or if nothing else just to shoot up their artillery to force your opponent to deal with them. Brandenburger are the raiding forces that the Germans used during the war. These units would perform raids to disrupt enemy reserves and movements. In the game these cards can really mess your opponent up. 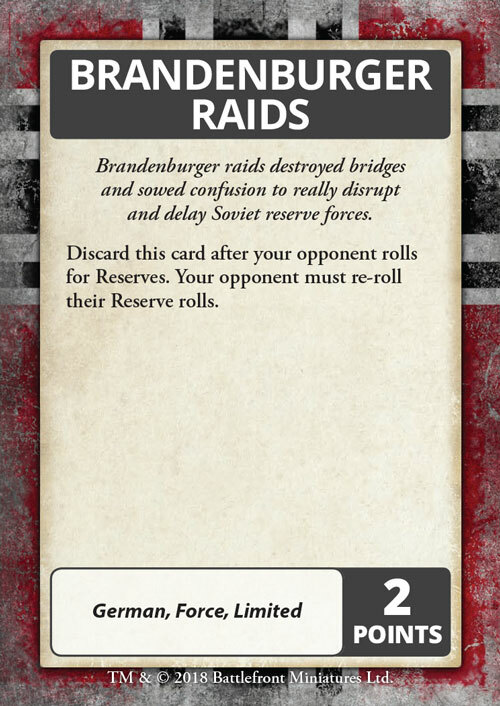 Brandenburger Raids will force your opponent to re-roll their Reserves roll, a powerful ability that could let you prevent key reinforcements from arriving too early in your game. 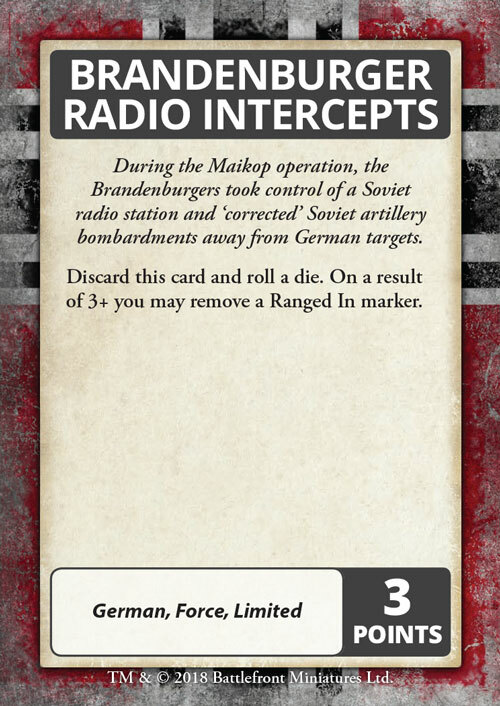 Brandenburger Radio Interceptors can remove an enemy Ranged In marker. 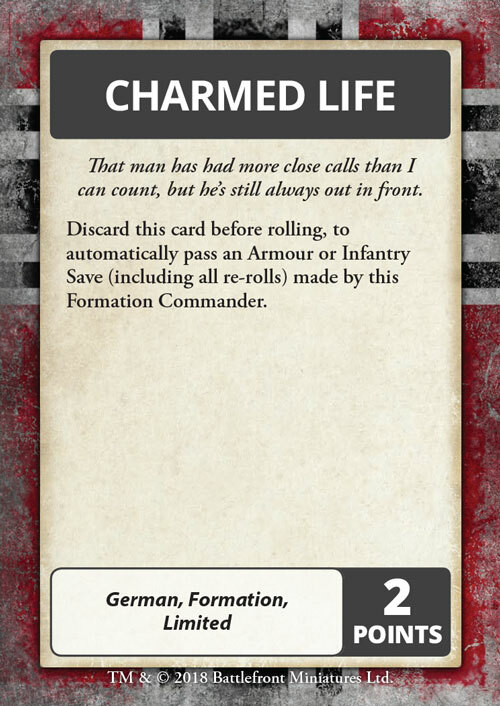 This card could be really powerful against enemy formations that have a low skill rating who tend to count on those pre-ranged in markers to get some early game casualties. 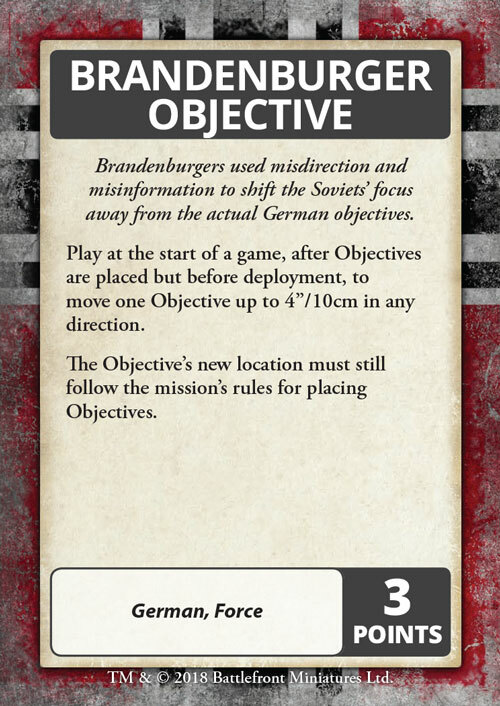 Lastly Brandenburger Objective can mess your opponent up, if they placed an objective on your side of the table in the open you can move it into cover. Moving an objective can be a powerful thing that can throw off your opponent’s plans. There is fewer things cooler than remote controlled weapons, but a remote controlled bomb, in WWII, now that’s a whole other level of awesome. Goliath bombs almost feel like a bit of Sci-fi in WWII. In the game they are useful for pinning down a platoon you wish to assault and to take out troubling models that may mess up your assault. Personally I will be trying to use them to take out pesky HMG teams before I launch an infantry assault, or take out key gun teams so I can advance my Tanks. Overall the Goliath Bomb is handy thing to have around, and they look awesome.